Email address Password Forgotten password? 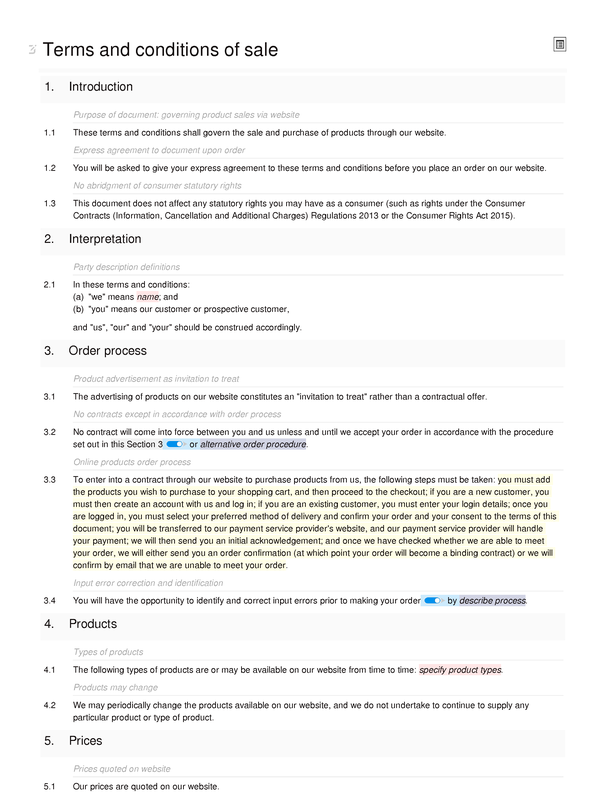 This template may be used to create terms and conditions to govern the sale of physical products, through a website, to consumers, under a contract governed by English law. 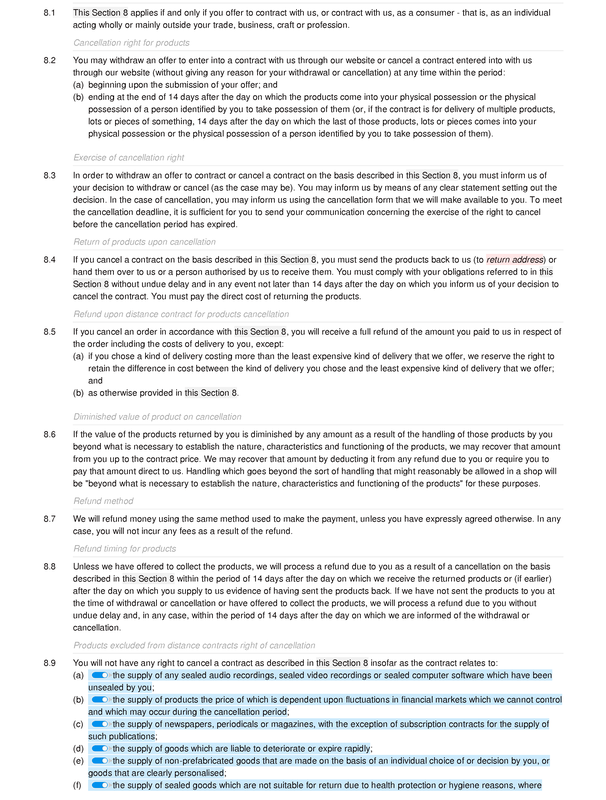 The template does not make any assumptions about the types of products sold (although the sale of some types of products will of course be subject to special regulation, which will not be accounted for in this template). The template takes specific account of applicable consumer protection legislation, and assumes that customers will be protected by that legislation. 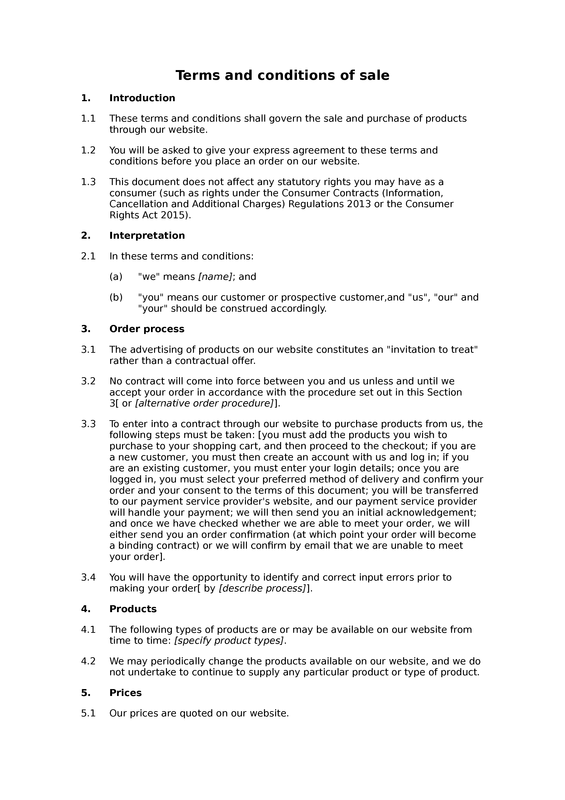 Accordingly, it is not suitable for use in relation to websites that sell products to other businesses. 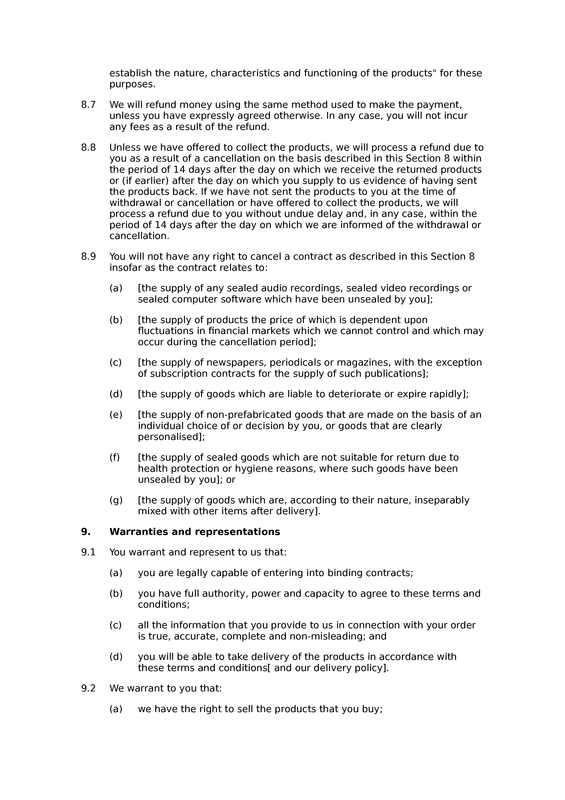 Nor is the document suitable for use in relation to the sale of services or downloadable products. Introduction: purpose of document: governing product sales via website; express agreement to document upon order; no abridgment of consumer statutory rights. Order process: product advertisement as invitation to treat; no contracts except in accordance with order process; online products order process; input error correction and identification. Products: types of products; products may change. Prices: prices quoted on website; prices changes on website; amounts inclusive or exclusive of VAT; website prices may be incorrect; delivery charges. 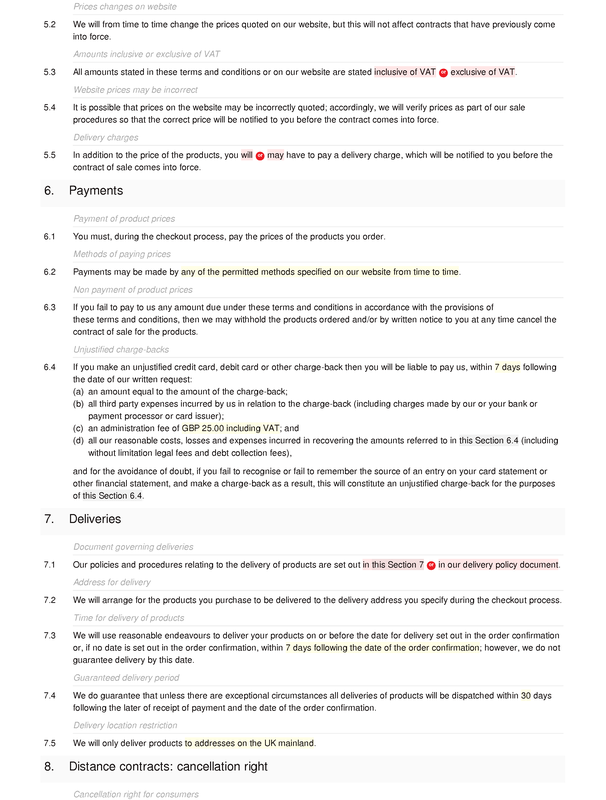 Payments: payment of product prices; methods of paying prices; non payment of product prices; unjustified charge-backs. Deliveries: document governing deliveries; address for delivery; time for delivery of products; guaranteed delivery period; delivery location restriction. 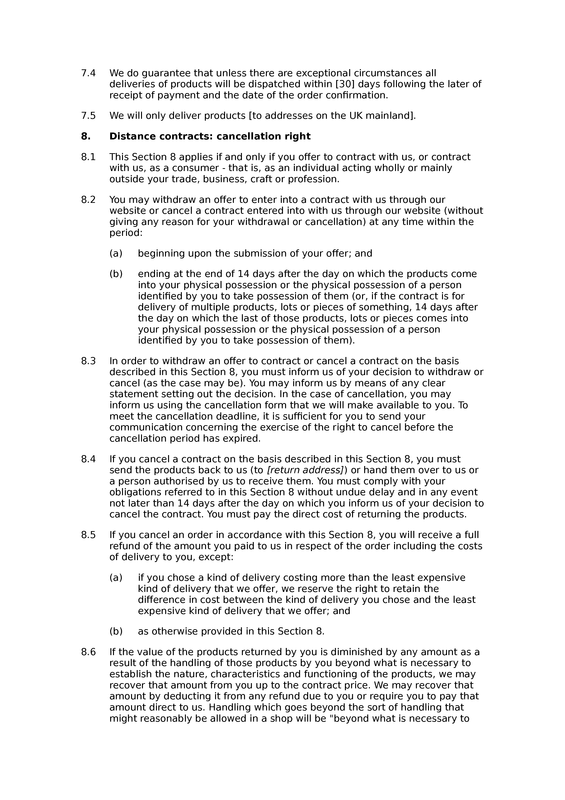 Distance contracts: cancellation right: cancellation right for consumers; cancellation right for products; exercise of cancellation right; return of products upon cancellation; refund upon distance contract for products cancellation; diminished value of product on cancellation; refund method; refund timing for products; products excluded from distance contracts right of cancellation. Warranties and representations: customer warranties and representations including delivery of products; seller warranties relating to products; no implied warranties or representations relating to sale of products. 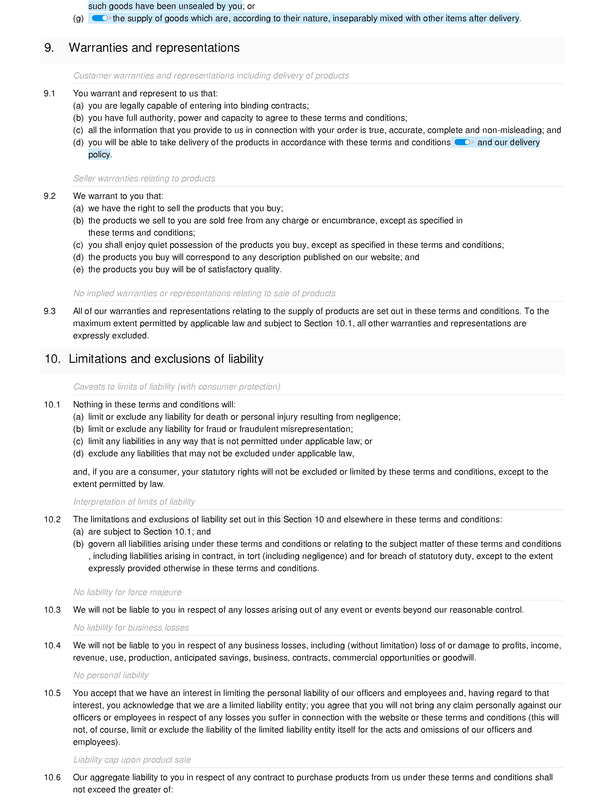 Limitations and exclusions of liability: caveats to limits of liability (with consumer protection); interpretation of limits of liability; no liability for force majeure; no liability for business losses; no personal liability; liability cap upon product sale. Order cancellation: cancellation by first party upon breach; cancellation by second party upon breach; cancellation by first party upon force majeure. 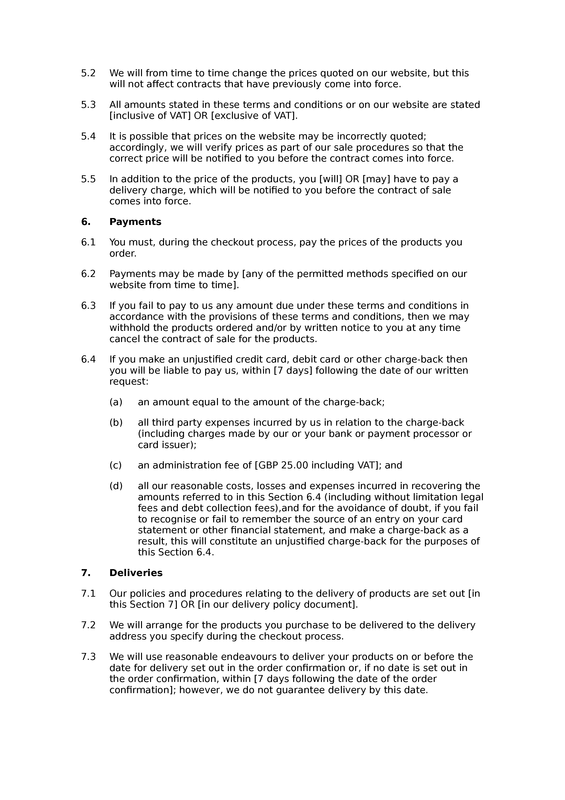 Consequences of order cancellation: consequences of cancellation of contract to delivery products. Scope: document does not cover IP; document does not cover licensing; document does not cover services. Variation: revision of document by publishing new version on website; variations govern future contracts. Assignment: assignment by first party (with consumer rights); assignment by second party. No waivers: no unwritten waivers of breach; no continuing waiver. Severability: severability of whole; severability of parts. Third party rights: third party rights: benefit; third party rights: exercise of rights. Entire agreement: entire agreement - sale of products. Law and jurisdiction: governing law; jurisdiction. Statutory and regulatory disclosures: copy of document not filed; language of document; value added tax number; link to ODR website; name and URL of ADR provider. Our details: website operator name; company registration details; place of business; contact information. This is a shortened preview of the editor interface; once you create your instance you'll be able to edit the full document in our online editor. This is a shortened preview of the DOCX output; once you create your instance you'll be able to download the full document in PDF, HTML, RTF and/or DOCX (Microsoft Word) format. Which licence should I choose? † These figures are approximations. We do not limit the number of copies of a template you can make on your own computer. Nor do they limit the number of times you can print and sign a document. We do however limit the number of copies of a template you can create in the Docular editor, and also the number of websites / digital products with respect to which a template may be used. There are four different licences under which you can access a Docular template. Document templates are the products available for sale on this website; whereas document instances are "clones" of the templates, which you can edit using Docular's online editor and export from the website. We will update our document templates from time to time, but this will not affect your document instances. When you create a document instance, it will be based upon the latest version of the underlying document template at the time of creation of the instance, irrespective of your date of purchase. You can save your document instance to our servers at any time, and return to editing later. Once you are happy with your editing, you can export the document and save it to your computer. The licences include numerical limits upon: (a) the number of websites (including cloud services) on which documents may be published; and (b) the number of digital products (such as software programs) with which documents may be distributed. All of our paid licences allow you to sub-license to a client of yours the right to use a document created using Docular. When you sub-license that right, it becomes attached to the particular client. The number of sub-licences you may grant is numerically limited and, again, the limitation corresponds to the document instance limitation. This is the period of the licence to use documents created using and exported from the Docular online editor. In short, the licences do not expire. There are no ongoing licence fees. Each free template includes a textual credit for Docular and/or SEQ Legal (eg "this document was created using Docular") and you must retain that credit in all versions of the document. For full details of the licensing rules governing the use of Docular templates, instances and exports, see our terms and conditions. You will be logged out soon.